Todd Stiefel, a wealthy businessman, is responsible for bank rolling many atheism activism projects. (CNN) - Todd Stiefel is far from a household name, and the odds he gets recognized on a street corner, even in his hometown of Raleigh, North Carolina, are small. For Stiefel, a slim, scruffy ex-Catholic, his public persona is his wallet and activism. Through the Stiefel Freethought Foundation, the 38-year-old has made an indelible impact on the nation’s fastest-growing “religious” group: the nonbelievers. Most of the highest-profile atheists campaigns –- flashy billboards in high-traffic areas, news-making efforts to get atheists to come out of the closet, and boisterous rallies - are funded by his fortune. Stiefel isn’t shy about his far-reaching goals. So far, Stiefel has pumped $3.5 million into those aspirations, and his money benefits a number of atheist organizations, from the Clergy Project, a group that helps atheist and doubting clergy out of the closet, to American Atheists, arguably the most in-your-face atheist group in the country. Stiefel sees his work as far more than just money. For him, this is just the beginning. Stiefel was born in Albany, New York, in 1974 to Catholic parents. He was raised in a Catholic household, confirmed in the church, attended Sunday school, went to a Catholic high school. At 18, Stiefel attended Duke University to pursue a degree in psychology. To fill an elective, he took an Old Testament history class at the Duke University Divinity School. It was there, he said, that his final “ebb” away from belief took hold. In the class, Stiefel said he saw a flawed logic in the Old Testament. In particular, he said, he began to see much of the Old Testament as unoriginal stories that had been told in many pagan traditions. After graduating from Duke, Stiefel went into the family business: Stiefel Laboratories, a company that develops products to combat skin diseases. For 12 years, Stiefel worked with his family and turned the business into a major player in their specialized market. In 2009, with Stiefel in an executive position, the Stiefel family opted to sell the company to GlaxoSmithKline. The price tag: $2.9 billion, according to media reports at the time. And like many who have the luxury of doing exactly what they want, Stiefel began thinking about what he was truly passionate about. After kicking around the idea of starting another business, the answer became clear to the young millionaire: advocating for atheism. Stiefel put $2 million in to begin his foundation. In his first year, according to tax documents, the nonprofit disbursed $700,000 to groups like the Secular Coalition for America, the American Humanist Association and Americans United for Separation of Church and State. In 2010 and 2011, the giving continued with the foundation distributing around $750,000 to different atheist and humanist causes. In 2011, he also pumped another $500,000 into his foundation. But recipients of the money, such as David Silverman, president of the American Atheists, see his impact as much greater than just a one-off activist. 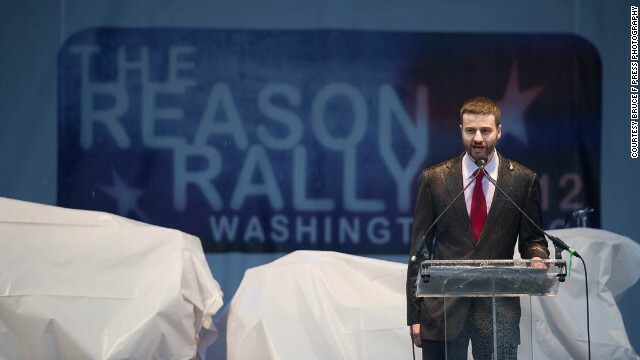 One of Stiefel’s major concerted contributions in the last three years was the Reason Rally, an event held on the National Mall in Washington, which was billed as a watershed moment in the atheism movement. The goal of the event was to show to religious Americans that atheism was a powerful minority in American life. 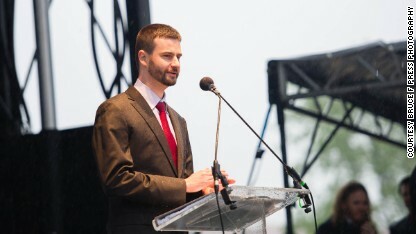 Stiefel speaks onstage at the Reason Rally. The rally drew a number of high-profile speakers, including Richard Dawkins, the author of “The God Delusion,” and thousands of attendees, despite rainy weather. Stiefel put $250,000 toward the rally, a contribution that Silverman, the organizer, said was critical. Silverman and the Reason Rally advocated for a specific brand of atheism. Silverman, who regularly calls his group the “Marines of the Freethought Movement,” is not shy in making it clear that he views his goal in calling out religion and elevating atheism. Stiefel says he doesn't necessarily endorse those tactics wholly, but he does see their validity. Evidence of that is his work on cancer fundraising. In 2012, Stiefel approached the Foundation Beyond Belief with an idea of creating networks of nonbelievers around the country to help raise money for the Leukemia & Lymphoma Society. Stiefel tapped into his atheist network and began organizing different event. In total, the atheist groups raised $430,000 in 2012, including a $215,000 donation from Stiefel and his wife, Diana. “Across the country there are 150 local groups of atheists and freethinkers raising money for charity,” Stiefel said proudly. The key, however, was bridging the gap between atheist and religious communities in the name of charity. For 2013, the goal is to raise $500,000. With money and resolve comes great influence for Stiefel. He has the ear of many atheist leaders, meaning he can dictate the movement’s focus. Stiefel said he wants to see the atheism movement expand its footprint. For Stiefel, this is a personal priority. He says his wife, whom he describes as a skeptical Christian, is someone who would fall within an expanded atheist movement. Next entry »My Take: Will gay rights infringe on religious liberty? I'm not sure where you are getting your information, but good topic. I needs to spend some time learning more or understanding more. Thanks for excellent information I was looking for this information for my mission. 9999 The job you've got achieved has gotten you this much. These station replica handbags in many cases are the clone with the authentic beautiful channel totes. You have a great blog here! Do you write professionally for a company or is this just a hobby? do you fear thor? odin? ganesh, baal? The Christian God is true and Atheism is disproven. Debate raging right now on the highplainsparson blog. Um.. No. You have Zero proof that the fairytales in your bible are true. None. Atheism is still the proper default. Don't waste your money for a lost cause. Return to the LORD, and you will be real healthy and happy, forever. There is no proof. Fairytales. Deal with it. The god of your holy book is a fabricated myth. Does not exist. I'm no astrophysicist so when the experts say the Earth is 150 million km from the sun and that the speed of light is 299792.458 km/s, I take them at their word. They are witnesses to these truths. They seem sincere and have credentials. When the same scientists speak about God, they are no longer speaking as a scientist but as a philosopher, a theologian. The scientists have witnessed to what they know, and Jesus has witnessed to the things he knows to be true. Your logic is flawed. Through the scientific method scientists were able to PROVE the speed of light and the distance between Earth and the Sun. Whether you "believe" this or "take their word for it" or not does not change the fact that it is true. However, Jesus was no scientist, he never revealed concrete evidence. People followed because they assumed it was true. Science is not assumption but absolute proven fact. Have faith in Jesus Christ. It sounds like Todd Stiefel and his wife are searching for a community of folks who are less "tribal" than are atheist or theist communities. Instead, they might make good candidates to join the "pluralistic rationalist" community of theists & atheists, conservatives & liberals, and others with disparate beliefs and backgrounds, who espouse "transbelief reasoning dialogues" and practicing a reasoning lifestyle. - Frank H. Burton, Ph.D., Executive Director, The Circle of Reason (the first international society for pluralistic rationalism).